That is my plan eventually. I’m planning on putting a 10 gallon in the equipment section to top off the ATO. That way I won’t be refilling it every 2-3 days. I have had 2 for years now. 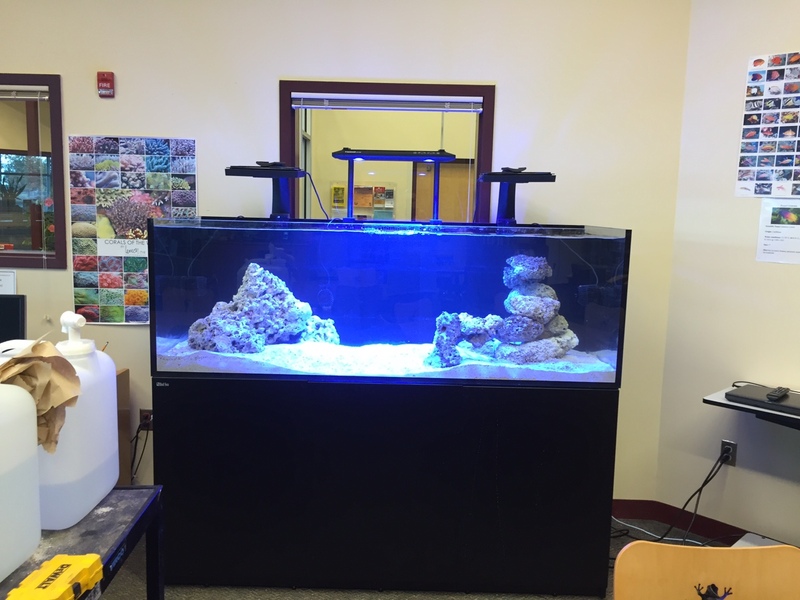 I had the tank in my classroom and another set up in the library. 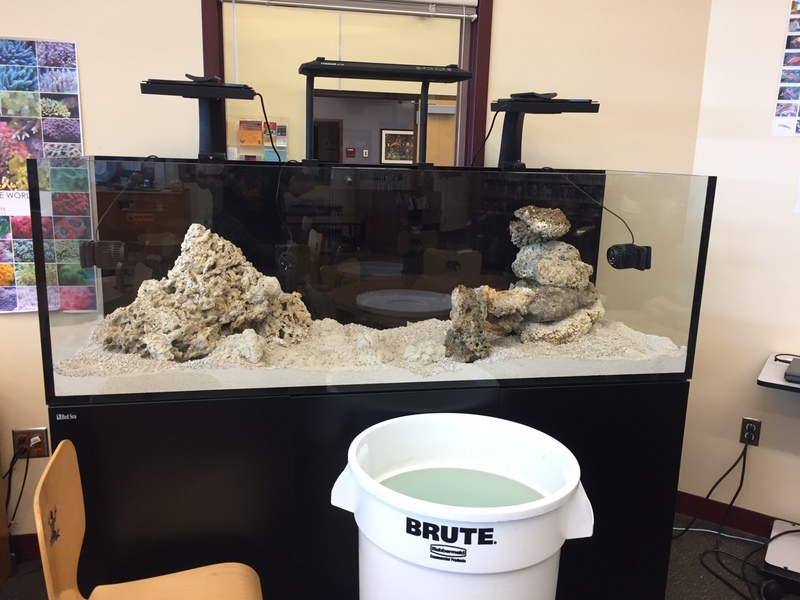 We had a tank to replace the one in my classroom on order when the tank in the library split a seam and dumped about 50 gallons of water on the floor. Fortunately, the librarian is very understanding. She was actually working with the secretary to try and hold the water in the tank by plugging the holes with their hands when I arrived that day. It was actually a funny site! I have had a lot of the livestock in holding, but will only be keeping a fraction of the corals since most of the rock with coral is covered with majanos. I did use a couple of pieces of dry rock which I don't usually do so now it's a waiting game until the tank cycles. Hopefully by the time I host in a couple of weeks, but I haven't even tested the water yet. So the tank is full and cycling full swing, I have been thinking about what direction I would like to go with this tank. In the past it was set up as a Caribbean biotope and I really liked the idea in theory, but it posed a ton of challenges. The greatest challenge was acquiring livestock. The options and availability of specimens for this ecosystem are very limited. What are your thoughts on the direction I should take? Should I move away from the biotope concept and just do a typical reef tank with mixed species from all over the world? My vote is for 100% captive raised and/or aquaculture. Coral and fish. Show that you can have a totally bad a$$ tank without taking anything from the wild. Put a label on the tank saying so too. I bet you could get a donation of fish if you write to ORA/SA etc. I really like that idea! Not a teaching tool about an ecosystem, but a teaching too about environmentally friendly practices. Matt_Arian, Dr.DiSilicate, kchristensen8064 and 1 other person like this. Tester corals that are doing well. Now to start stocking! geekengineer and neil82 like this. The ASM G-3 that I had I rebuilt it with all new seals and a new pump. Thing has been pulling scum like crazy! jda123 and TheRealChrisBrown like this. Looks great! Those ASM skimmers are really well designed. No frills... just work. What are you lighting the fuge with? geekengineer, Bdk1786 and larryl like this.